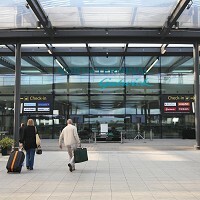 Thousands of holiday makers have been left without their luggage for days after a power cut at Gatwick Airport meant their baggage did not make it onto the same plane. The outage occurred at around 3.30am on Saturday and although it was swiftly fixed, it left eight baggage belts frozen for around seven hours and 2,500 bags did not make the same journey as their owners. One of the passengers caught up in the mishap was crime writer Peter James who was flying to the French Alps on a British Airways flight. He tweeted: "Sunday morning in the French Alps and still no bags. British Airways have taken utter incompetence to new heights." Travel insurance packages can help protect passengers against the cost of lost or delayed luggage. A spokesman for the word's busiest single-runway airport said many bags were put on flights and airlines like Thomson were flying over easyJet passengers' bags to the correct destinations and passengers should be reunited with their belongings by Monday at the latest. The airport added: "We have been working round the clock with our airlines and their handling agents to ensure bags were put on flights."